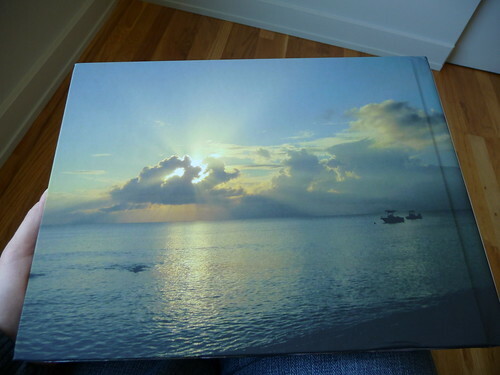 Recently I took advantage of MyPublisher’s offer to try their new hardcover photo cover for $20.00. I got so caught up in putting it together and I had some major trouble with the software on my PC that I never got a chance to post on it. I literally had about 6 or 7 phone calls, emails and chats with customer service to try to get the book ordered within their short deal timeframe. I just received the book a couple of days ago along with my second HotPrints HotBook. I’ve posted two sets of photos of the recent photo books to my Flickr photostream, so while I take a little break to make more books, feel free to check out my mini review on Flickr and see the latest photos of MyPublisher’s latest feature as well as HotBook #2. Let me know what you think and look out for a detailed review to come. hrmm, I must have done my cover wrong! I didn’t realize you could have the pic fill the entire page both front and back. I must have missed a drop down box of options or something, ARGHH! Thanks for your sharing your experience with MyPublisher. Yes, it can be a little confusing. I remember on a vacation book I did last summer I had to dig around to find the full cover option (the one where it allows you to put the title over your photo cover without a background label). I clicked on the one I thought was the right one and but it had a black background behind it and it didn’t seem right. I just kept clicking on the template layouts in the cover section until I found the one I wanted. It can be hard to tell what a particular layout does unless you keep clicking on them to see what they are – that’s why it takes me so darn long to finish a book!